Bentley University’s ACELAB (Accounting Center for Electronic Learning and Business Measurement) integrates technology into coursework and provides a collaborative environment for tutorial instruction and hands-on learning experiences with commercial accounting software. 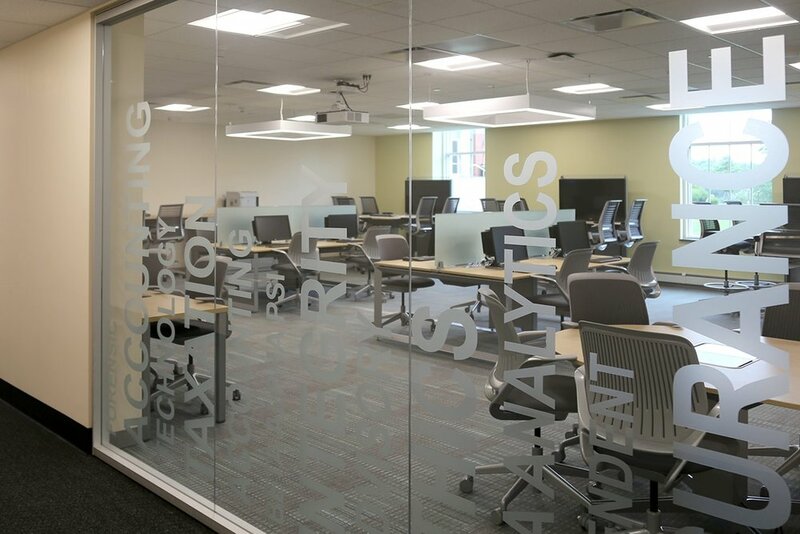 When the ACELAB needed to relocate to an expanded suite in Lindsay Hall, Bentley engaged MDS to design and execute the renovation. The open concept accounting lab is modeled on today’s collaborative workplaces with state-of-the-art technology and fresh, contemporary interior finishes. Designed to better engage undergraduate and graduate students, group workstations with 42” display screens are complemented by individual workstations and a conference room with a Smartboard and distance learning capabilities. New transparency to the corridor and prominent signage showcases the ACELAB programs to the broader Bentley campus community. The 1,400 sf facility opened for the fall 2017 semester.